Home / Books / Bada-Bing! Ryan Matney is back with eleven all new card tricks structured for the real world. Flush Exchange and seven more effects. 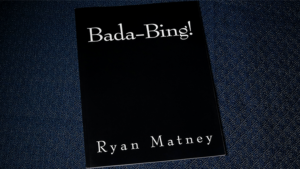 Every item features the thoughtful construction, eccentric plots, and practical performance considerations that are Ryan Matney‘s signature. 60 pages with 98 photos making everything crystal clear. “I’ve had the pleasure of knowing Ryan Matney for years – we even hired him to work the Twin City Convention. I have a couple of his books and can assure anyone he is one of the best thinkers I know.